Ryan Lochte and Gabby Douglas: A tale of two Olympic "scandals." Gymnast Gabby Douglas “disrespected” her entire country by not putting her hand on her heart and smiling enough during the Olympics. Swimmer Ryan Lochte is a “kid” who deserves “a break” for allegedly destroying property and lying about a traumatic robbery. If you were wondering what white, male privilege looks like, this is it. To back up: On Sunday, it was reported that Lochte and three other U.S. swimmers were robbed at gunpoint in Rio, with specifics of the robbery coming from Lochte himself and his mother, Ileana Lochte. 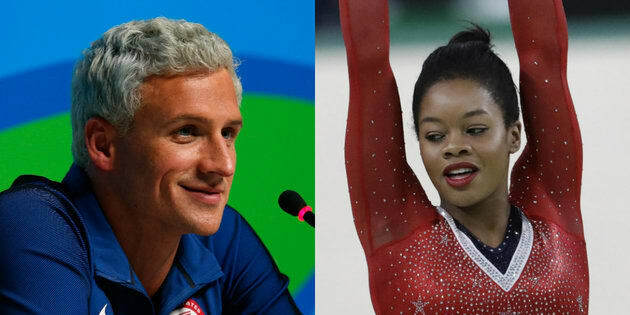 It didn’t take long for people to point to the cognitive dissonance between the compassionate, light-hearted response to Lochte, Bentz, Conger and fourth swimmer Jimmy Feigen’s drunken actions, and the widespread online vilification gymnast Gabby Douglas experienced just a week prior. Douglas, who is just 20 years old, failed to put her hand on her heart during the national anthem, and did not style her hair and/or face to every individual’s liking. For those “crimes,” she was widely criticized for being “disprespectful,” “unpatriotic” and “un-American,” and called words that we’d rather not repeat in this piece. Lochte and friends reportedly defiled a gas station restroom, fought with a security officer, lied to national news sources, and may have filed a false police report. And the four of them get to be framed as talented “kids” (reminder: Lochte is 32) having one debaucherous night of fun. The vast gap between these two public perceptions has everything to do with the identities of the people involved. Lochte is a straight, white man, who has long been beloved for his pretty face, doofy personality and charmingly slow demeanor during interviews. Douglas is a young, black woman who has battled racialized critiques of her appearance and attitude for years, despite winning three Olympic gold medals. is it just me or did people seem a lot more upset about Gabby Douglas not raising her hand to pledge than Ryan Lochte lying to police? This isn’t to say that Lochte and his teammates should be publicly vilified. But when the benefit of the doubt is given freely to white men when they mess up ― even in cases like this one where they actually may have broken the law ― and yet withheld from others, it perpetuates entrenched systems of racism and sexism. What if Lochte had been a woman (of any race) who falsely accused a man of robbing and attacking her? What if Lochte had been a man of color? These “what ifs” are important, and the resulting thought experiments are telling. White men exist in a world that prioritizes their potential, gives them the benefit of the doubt and assumes their actions are mostly benevolent ― or at the very least, harmless. Women, especially women of color, don’t have that luxury. Just ask Gabby Douglas.